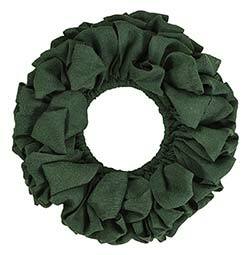 Decorate your front door, mantel, or wall space with one of our Christmas wreaths! 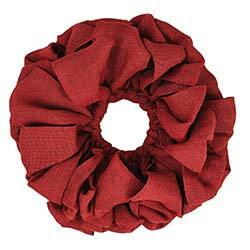 Or, make an instant centerpiece by pairing a candle with one of our candle rings! 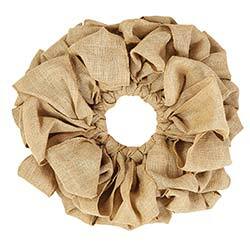 We have faux evergreen, burlap, pip berries, and more! 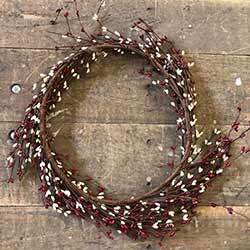 Burgundy & Cream Pip Berry Wreath - Add country color and texture to your wall, door, or table with this pip berry wreath! 16 inches. 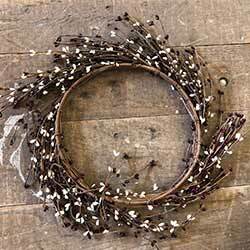 Burgundy & Cream Pip Berry Wreath with Rusty Stars - Add country color and texture to your wall, door, or table with this pip berry wreath! 16 inches. 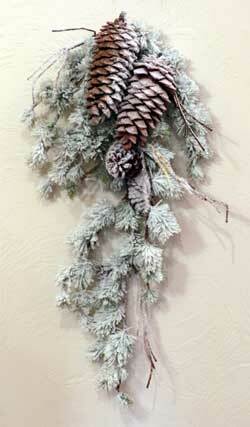 Frosted Pine with Pinecone Swag, by Raz Imports. 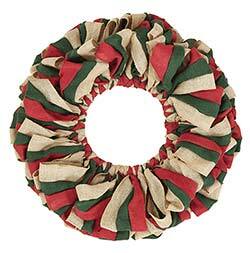 Hang this beautiful swag like a wreath above your fireplace, on your wall, or on your front door. 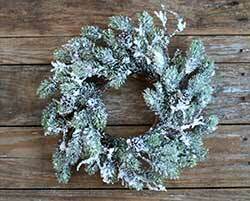 Made of frosted, icy faux greenery and pinecones, in white and brown. 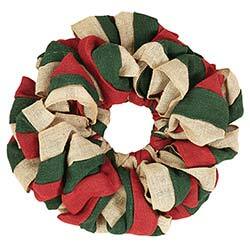 Measures 32 inches long. Part of the Woods Collection. 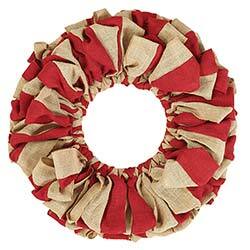 Jingle Pine Wreath, by Primitives by Kathy. 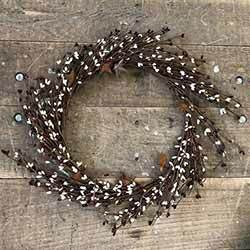 This beautiful wreath features faux pine greenery made of plastic (so, no dropped needles) tipped with superfine silver glitter. 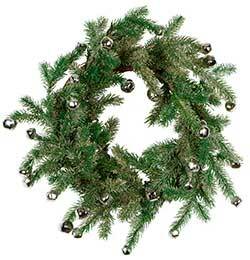 Accented with silver jingle bells. 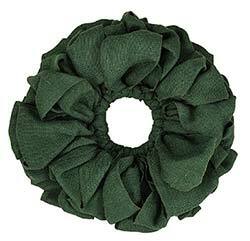 Use on a door, or in a small space on your wall, or on your table as a large candle wreath. Inner diameter measures 9 inches. 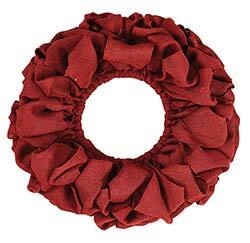 Red & Cream Pip Berry Wreath - Add country color and texture to your wall, door, or table with this pip berry wreath! 16 inches. 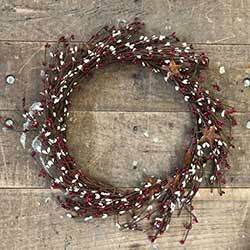 Red & Cream Pip Berry Wreath with Rusty Stars - Add country color and texture to your wall, door, or table with this pip berry wreath! 16 inches. 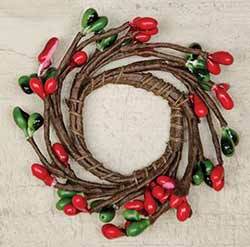 Features red and green resin pips on a brown-wrapped floral ring. Mini size is great for a tealight candle! 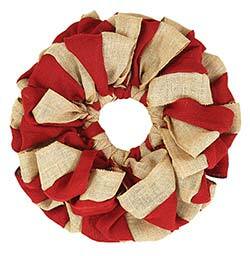 Red, Green, & Tea Stain Pip Berry Wreath - Add country color and texture to your wall, door, or table with this pip berry wreath! 16 inches. 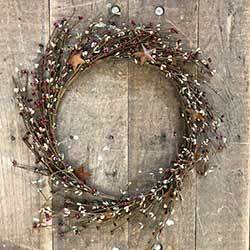 Red, Sage Green, & Tea Stain Pip Berry Wreath with Rusty Stars - Add country color and texture to your wall, door, or table with this pip berry wreath! 16 inches. 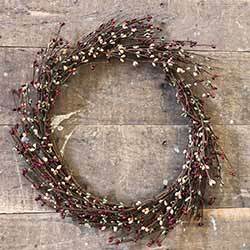 Hang in a small space, like your front door, or use as a candle ring for a centerpiece!